Mobile is already the largest banking channel by volume of transactions and its adoption by new customers is entering an exceptionally rapid phase. 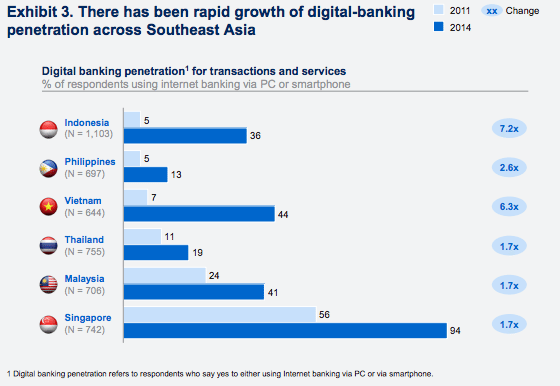 A survey (pdf) by McKinsey and Company found that across ASEAN (Singapore, Malaysia, Brunei, Cambodia, Indonesia, Laos, Myanmar, Philippines, Thailand and Vietnam), the proportion of people using digital banking doubled from 2011 to 2014, with Indonesia and Vietnam showing about sevenfold growth. KPMG estimates that the number of mobile banking users will double to 1.8 billion by 2019 and similarly, argues that Southeast Asia will be a main driver of this trend. The growing importance of digital banking throughout Asia opens opportunities for incumbents and attackers alike. In the region, one bank in particular is putting a lot of effort into leveraging technology to remain competitive. DBS Bank, Singapore’s largest bank and a leading bank in the continent, has committed to invest SGD 200 million in digital banking regionally. During the past two years, DBS has rolled out a number of initiatives, primarily in Singapore. These include DBS PayLah!, a mobile wallet for peer-to-peer payments introduced in May 2014; DBS SMS Banking, which allows users to perform simple banking transactions, introduced in October 2014; and DBS FasTrack, an app introduced in September 2015 that provides seamless ordering and payments solutions to merchants. Most recently, DBS announced the launch of “DBS digibank” in India, the bank’s mobile-first digital bank which promises a simpler, faster and smarter banking experience. 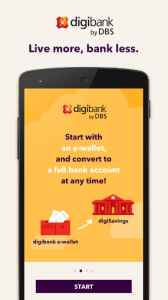 DBS digibank joins Pocket, a similar service designed primarily for mobile devices launched in February 2015 by ICICI Bank. Both services are among the very first digital banks in India. DBS digibank lets customers open a banking account with just a few steps. Users can customize their personal profile and create shortcuts for their favorite mobile banking services. They can also use a list of recent and favorite payees for faster transactions and log on to their account securely using their fingerprint. Since DBS digibank’s soft launch on March 14, the service has seen more than 200,000 downloads. In Singapore, DBS claims it has the largest number of online banking and mobile banking customers with over 2.5 million and 1.25 million users respectively. The launch of DBS digibank in India comes simultaneously with the launch of OCBC’s new mobile-banking app in Singapore designed for the Apple Watch. Unlike DBS’s PayLah!, OCBC’s new app isn’t meant to make payments but rather works as an easy tool to quickly access banking information. In Vietnam, digital banking penetration has grown to over 40% in 2014, according to McKinsey and Company, and players have started deploying relevant products. 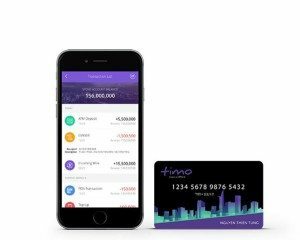 Powered by VPBank, Timo launched in March the country’s first digital-only bank. Essentially, the service lets you open a bank account in just a few steps and allows you to manage your finances using your smartphone. Plus, banking fees at Timo are much lower than those applied by traditional banks. For instance, users can withdrawal funds at more than 17,000 ATMs for free, and fund transfers from a Timo account to any other Vietnamese bank account is free of charge as well. South Korea’s Sunny Bank Vietnam, also referred to as Sunny Club, launched its mobile banking service in Vietnam in late-2015. Sunny Bank, a mobile banking service developed by Shinhan Bank, offers financial services such as loans via mobile devices. The app also features entertainment and cultural content, and capitalizes on the popularity of Korean fashion, beauty and culture among Southeast Asians. Two months following its launch in Vietnam, Sunny Bank managed to onboard over 10,000 clients. Shinhan Bank is South Korea’s top lender, also known for being the first player to launch digital banking services in the nation. Other South Korean banks that are capitalizing on the growth of mobile banking include Woori Bank with WiBee Bank, and the Industrial Bank of Korea with i-ONE Bank.